As powder builds up and some employees leave, a manufacturer salvages and streamlines its powder coating process with a larger, more efficient burn-off oven than its existing unit. Office managers and administrative personnel rejoice for the power of powder coating as they punch, clip, and snip files with artistic aplomb. As the years inch by in temporal increments of 8-hour workdays and 40-hour workweeks, reams of paper get stapled and collated, miles and miles of sensitive documents must be shredded, and snail mail must be sent to seal the deals. And where appearances must stand up, office equipment and supplies must shine while withstanding continuous, and often abusive, use. To help businesses put their best face forward, Martin Yale Industries, Wabash, Ind., coats its line of office machines and equipment with powder coating. Powder sticks. 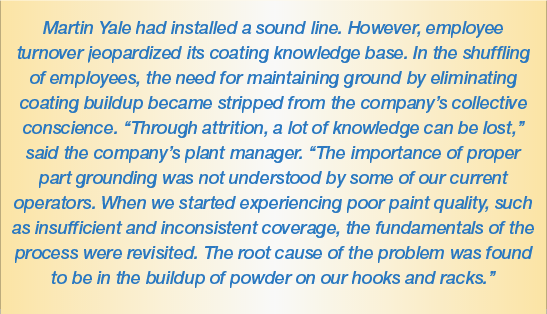 But there is a downside to powder’s amazing adhesion—how to remove powder buildup from hooks and racks to maintain ground and achieve the desired finish. This was the burning question Martin Yale Industries had to answer. 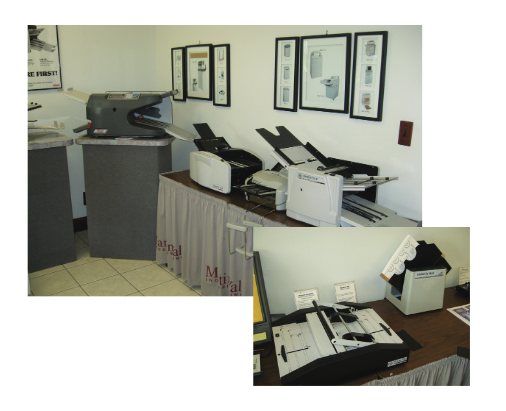 Martin Yale makes a variety of office machines and equipment, including document shredders, letter folders, envelope openers, business card slitters, check signers, and paper joggers. Within the company’s 140,000- square-foot-plant, workers fabricate all metal parts with high-tech equipment, such as a turret punch press and a computer numerically controlled (CNC) six-axis, dual spindle lathe with a bar feeder that makes some of the roller shafts for paper folders. Employees also heat-treat cutter blades and paper slitters in house. “And with the exception of some very large parts, we powder coat all of our own parts,” said Tyler Bear, plant manager. “About 90 percent of our metal parts are powder-coated. The remainders are anodized or black oxide.” The company switched to powder coating 10 years ago. Previously, the company applied liquid coatings. A number of factors drove the conversion, including safety and health concerns associated with liquid coatings and the durability of powder coating. The hybrid radiant tube burn-off oven operates at 93 percent efficiency and provides uniform heating to ±10°F, eliminating hot or cold spots. Martin Yale’s powder coating line uses an overhead chain conveyor. The three-stage pretreatment system starts with a phosphate wash and finishes with a fresh water rinse. All parts then proceed through a dry-off oven. Next, parts enter an environmentally controlled coating area. Line operators apply powder with a Nordson modular coating system including a Sure Coat controller and Versa Spray II automatic guns. In addition to three standard colors, Martin Yale offers its customers custom colors and textures that operators apply in a spray-to-waste booth. “We do a lot of custom catalog racks for specialty motorcycle and automotive parts suppliers,” Bear said. Finally, all coated parts move through a curing oven before cooling and unloading. To combat powder coatings buildup on hooks and hanging fixtures, the company used a burn-off oven. However, it was too small, limiting the amount of hooks and racks that could be processed per cycle. In addition, the oven had hot and cool spots. Consequently, hook-and-rack cleaning was very inconsistent. The company considered other methods to strip its fixtures, such as sending all hooks and racks out for chemical processing. This option wasn’t viable because of significant freight expenses. Outsourcing stripping also entailed slow turn-around times. 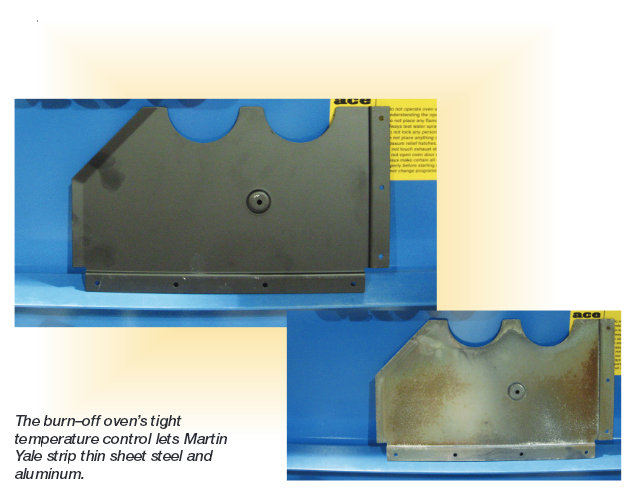 To keep parts running through the coating line, Martin Yale would have had to buy more hooks and racks to compensate for the off-site chemical stripping. Bear also considered contracting the burn-off process, but the expense of this type of outsourcing was also prohibitive. With outsourcing posing too large an expense and an existing burn-off oven too small to handle current production volume, Martin Yale needed an in-house solution that was less costly than contracting out for coating strip- ping, yet large enough not to hinder the company’s output. To find this solution, Bear delved into his past work experience. Before joining Martin Yale, Bear worked for a company that produced electrical transformers and coils. The transformers were placed on racks and dipped in a varnish for electrical insulation and thermal conductivity. These racks would build up an accumulation of varnish, and workers occasionally soaked the racks in methylene chloride to break it up. 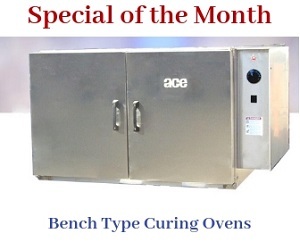 In looking for an alternative to chemical removal, that company turned to ACE Equipment (Armature Coil Equipment), Cleveland, for a burn-off oven to remove the varnish from racks. “The oven was reliable with low maintenance and worked great,” Bear said. “When I started working for Martin Yale and saw the oven that was being used and the problems that we had with it, I said ‘We need an ACE oven.’ ” Martin Yale needed the new oven to be delivered quickly to minimize disruption to production. 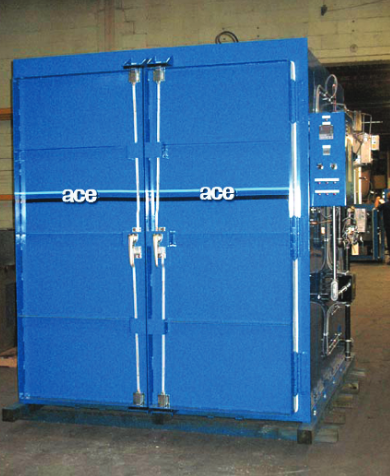 ACE shipped the oven in less than 6 weeks from the time Martin Yale submitted its purchase order. The hybrid radiant tube burn-off oven operates at 93 percent efficiency and provides uniform heating to ±10°F, eliminating hot or cold spots. The efficient burn-off system reduces natural gas consumption. The unit’s one-touch control system simplifies parts processing. After touching the button, the unit will detect the load, determine the time needed to strip coatings, and automatically shut down without programming or operator input. The oven combines infrared energy and radiant heat, and meets Factory Mutual engineering standards. The burn-off oven is also equipped with the status display option, which indicates more than 100 different combustion system faults. This feature allows maintenance to easily troubleshoot any problem that may occur. For further reading on the topics discussed in this article, see Powder Coating magazine’s Web site at [www.pcoating.com]. Click on Article Index and search by subject category. Have a question? Click on Problem solving to submit one. Celebrating 90 years in 2009!